so in the past week several small but annoying things have gone wrong with my prelude. After a week of heavy rain i discover a trunk full of water 2 ruined toolboxes along with several shirts, shoes, 2 jacks and jackstands. Then the side wall of my tire gets a bubble, and my front turn signal goes out. then my sunpass falls from the windsheild when im not in the car and puts a crack in my dash. I replace the tailight seal that was causing the leak, the tire, and the turn signal bulb, then my rad fan stops working. i want to remove the rust stains from my white trunk, did some searching and found nothing, and was wondering if you guys have used anything to remove rust stains. i dont want to buy something and it ends up not working. Google says lemon juice but im not sure how that will work. All of these stupid little things are happening during midterms, and im just trying to sell my car to help out my parents. sorry for the rant and the long post just needed to vent a little. Re: interesting week...removing rust stains? Is the rust stain inside the trunk or on the exterior? Picture would help a little. If it's on the inside I've used some rust inhibitor junk that removes the rust and primes at the same time. i took this when the water was draining out but you can see the space around the spare. That's a good idea on where to put the jumpers, I tuck mine between the tire and wall..
Anyways, use some Rust Converter/Reformer or anything that will remove rust. 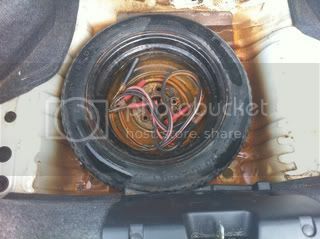 If you use a liquid that must be cleaned up then pull the drain plug at the bottom of the trunk when you need to drain. Or option 2 is sand paper and paint. I thought it was a good idea too until those rusted too ! I will definitely try that rust converter stuff. Any recommendations ? Klean-Strip Rust Converter works pretty good. It will leave it a black primer like surface ready for paint.